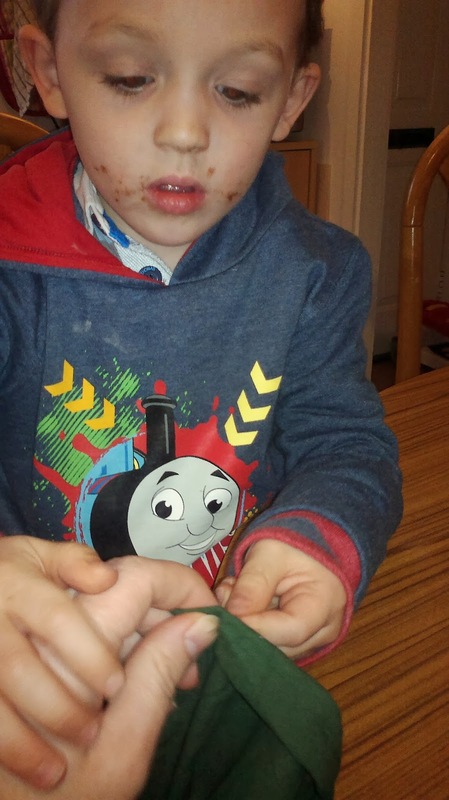 This week Ollie has been interested in all things 'Knightly', fuelled by a toy knight on horseback at our signing playgroup and the Thomas film and books 'King of the railway'. 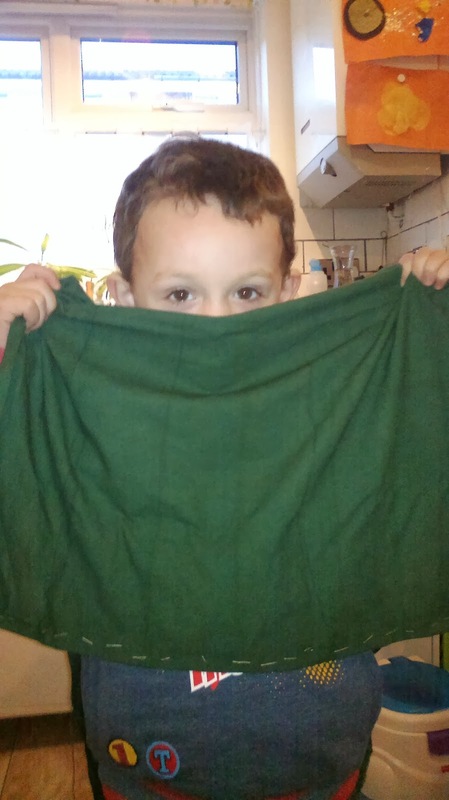 I thought it would make a great opportunity to introduce him to sewing, since he could have a try at making a tabard. First we had a look in one of his castles books so he could see what the Knights in the book were wearing - a tabard with a crest on it worn over their armour. Next I dug out a length of curtain liner fabric that I had dyed experimentally when I was dying some trousers in the summer. I cut a neck hole out and laid a piece of fabric behind for Ollie to mark in chalk, then I cut out this neck facing piece. I started Ollie off with whip stitch round and round to join the facing on in a way that would stop the edges fraying, then showed him running stitch which he used to attach the facing more securely. 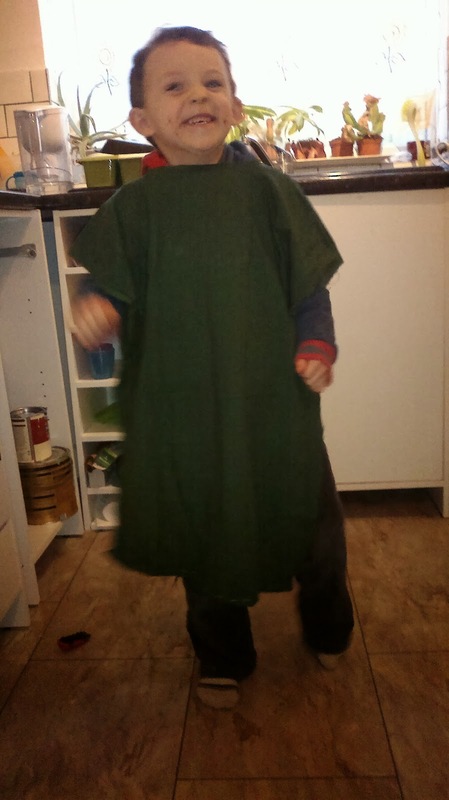 After checking again that the tabard fit over his head, we then did the hems. I rolled the edges over and pinned them, and Ollie did his running stitch along them and removed the pins as we went. We made the whole thing in three days, with about 20 minutes sewing at a time. 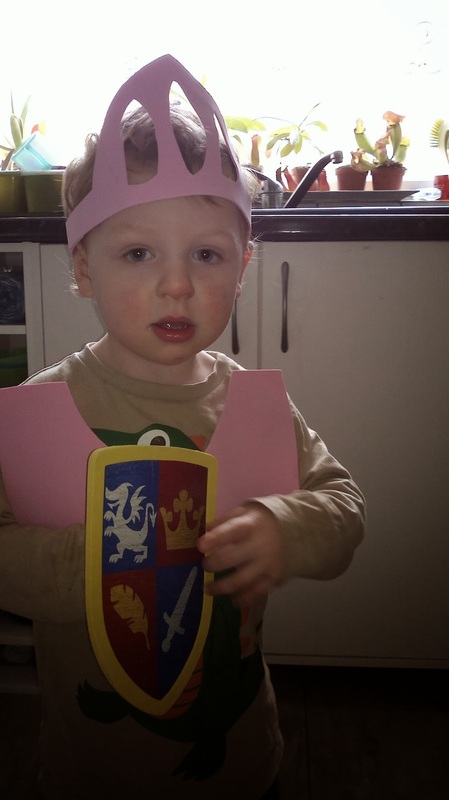 Ollie has also drawn onto paper a shield with a crown on it which I'm trying to work out how to transfer onto his tabard, most probably I'll copy it onto craft foam and then stick it on with double sided tape. My mum taught me to mend and sew on buttons, but everything else I have picked up since joining the Vikings historical re-enactment group a couple of years ago since I suddenly had to learn how to make re-enactment clothes. I'm still not very confident with a sewing machine, so am very lucky that Matt's mum taught him well and he can get me set up and sort me out when I go wrong, although I mostly stick to hand sewing. As a life skill sewing is something that had been declining but which has enjoyed a resurgence recently, so it is something I am glad I can now start to pass on. For anyone daring to say that sewing is for girls, they can just try that line on some of my Viking chaps as they make their own kit with far more skill and flare than I could ever match. For the rest of the 'Knightly' outfit I initially tried to make a helmet and armour from a corrugated cardboard box, but a combination of my rubbish design and parcel tape which wouldn't stick made this attempt a flop. I had a thought that we could make something out of craft foam, so we tried that next. Ollie really wanted a helmet with a visor he could pull down, but in the end I made something that was based on a Mike the Knight helmet he'd had as a card cut out from a magazine. The picture below is of Toby in his choice of a pink helmet. My lack of skill has left the helmet looking more like a tiara but Toby seemed to understand and kept saying 'nigh hah' (knight hat). I used the spare piece of foam left over from the helmet to make a sort of armour breastplate - everything is just stuck with double sided tape. I expected the helmets to last about five minutes, but we've had a couple of days of play from them so far without them getting pulled to pieces. I can see me spending at least part of next week working out how to make leg and arm armour out of A4 sheets of craft foam, and the rest of the week on the floor being 'Galahad'. Perhaps the first thing I should make from the craft foam is some knee pads for myself.